AS Solar office production and storage building - Conversion of an industrial building into an office building in PH-standard. 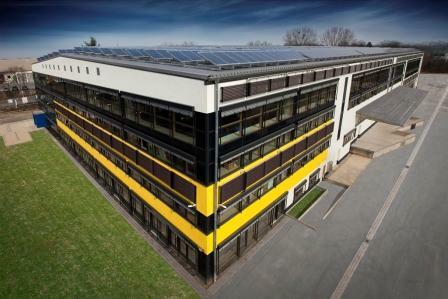 In June of 2011, AS Solar moved into its new head offices in Hannover: a modernized, highlyefficient industrial construction which, by consistently using solar energy and biomass technology, produces more energy than it consumes. Built in 1959, the former Telefunken building had been sitting empty for more than 10 years, and had been severely damaged by vandalism. It is a rectangular structure (94 m x 53.5 m) with a height of 12.1 meters. The basement under the western part of the building extends up to 6.2 meters underground; above ground, it has a three-story front structure plus a main structure with two halls situated one above the other. After completely gutting the reinforced concrete frame, the construction team created around 6,000 m2 of office space in addition to the production and logistics areas. Different efficiency standards were used in each area, depending on the interior temperatures desired: offices and similar spaces were constructed to meet Passivhaus standards; the circa 1,000-m2 manufacturing area was renovated in accordance with the German Energy Savings Regulations of 2009; and the approximately 2,400 m2 of gross storage area space remained unheated.